The first step toward a solid foundation in Buddhist thought! The Foundation of Buddhist Thought series is an excellent introduction to Tibetan Buddhism. 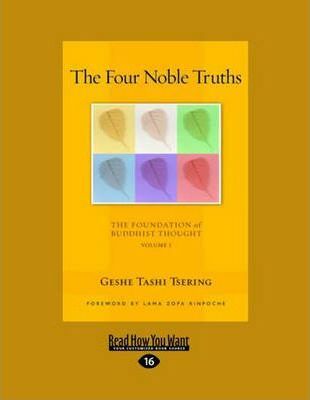 These unique books, based on the curriculum of a popular course of the same name, were developed by Geshe Tashi Tsering, a Tibetan scholar renowned for his ability to render Buddhist teachings accessible and relevant to everyday life. Geshe Tashi Tsering's Foundation of Buddhist Thought courses are systematic introductions to Buddhist philosophy and practice. With this series of books drawn from his highly successful courses, his insights can now be enjoyed by a wide audience of both specialists and newcomers to the Buddhist tradition. Geshe Tashi's presentations combine rigor and comprehensiveness with lucidity and accessibility, never divorced from the basic humanity and warmth of his personality. In Geshe Tashi, we encounter the new generation of Tibetan monk-scholars teaching in the West who are following in the eminent footsteps of Geshe Wangyal and Geshe Sopa. This volume, the first of six, provides a complete presentation the Buddha's seminal Four Noble Truths, which summarize the fundamentals of the Buddhist worldview. Indeed, they are an essential framework for understanding all of the other teachings of the Buddha.